The WNK4DDN natural gas model of MHP grills is proudly made in the U.S.A. and is backed by a full lifetime warranty on the grill housing, mounting, burners and cooking grids/warming racks. 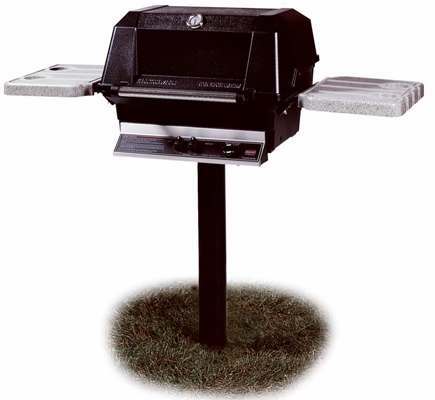 This grill has a stainless steel burner, stainless cooking grids, electronic ignition, stainless heat indicator, stainless front handle, 642 total square inches of cooking area and thick aluminum housing for years of trouble-free use and dependability. This gas grill also allows you to smoke, rotiss (optional rotisserie) and bake all in one outdoor unit! Available for a post mount, black or stainless steel cart mount or patio base. WNK Model specific features include: 40,000 BTU's of cooking power and fold-down stainless steel side shelves with tool holders. (Plastic Shelf is shown but stainless steel is included)This is the perfect size grill for empty-nesters or those that do not cook for larger groups of people at a time. Package-priced here as a post mount, with MPP in-ground post included.